Get ready for a better cleanse with NEW Simple Micellar Water. Triple purified and enriched with minerals and multi-vitamins, Micellar Water is designed to give your skin its most gentle and thorough cleanse. It works to remove make-up and impurities while unclogging pores, leaving skin feeling clean and refreshed. It instantly boosts skin hydration by 90% for effective, yet gentle, cleansing. By selecting only the purest of ingredients and leaving the harsh ones out, Simple helps you care better for your skin every day, leaving it looking (and feeling) great. Now, it’s easier than ever to get skin that’s hydrated and fresh. 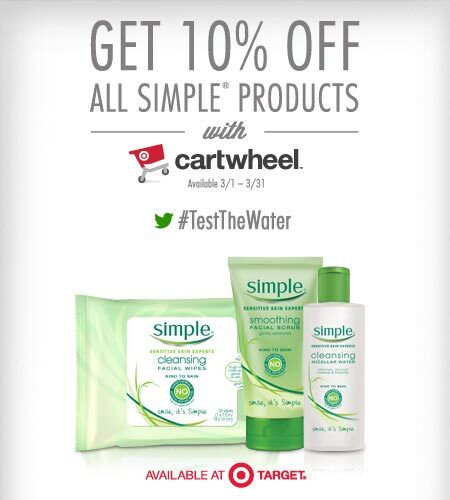 Between 3/1-3/31, get 10% off your next Simple purchase at Target through Cartwheel. 2. Wipe it around the face and eyes. 3. No need to rinse. Just enjoy beautiful and hydrated skin. $25 Target Gift Card Giveaway: You have 2 ways to enter, enter one or both. Entry #2: Tell me why you want to try NEW Simple Micellar for a chance to win a $25 Target GiftCard to use towards your own. Just tweet my handle @AllThingsTarget using #BetterCleanse and it could be yours. Giveaway will end on Saturday, March 14th at 9:00 pm PST. Good luck! Sponsored post by Lunchbox, all opinions are 100% my own. 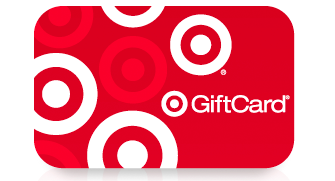 The Bullseye Design, Target and Target GiftCard are registered trademarks of Target Brands, Inc. Terms and conditions are applied to gift cards. Target is not a participating partner in or sponsor of this offer. Definitely agree – no need to rinse is a big selling point! It’s seemed to be a LONG winter with dry skin………………this would be refreshing & moisturizing! I love the simple products and would love to try this new product! I LOVE their eye makeup remover!! It is so gentle on my eyes, especially since I wear contact lenses, they don’t bother them at all. I would love to try out their other product! I like the Simple cleansers already – this one sounds like it’d be great too! I’d love to try it for an easy clean that does not produce any waste like daily face wipes! i have other simple products and i love them, so i would love to try this one. I love the no rinsing and how easy it is to use. Anything that makes it easier to wash my face at night when I’m exhausted would work for me, and no rinsing means one less step. I would like to try Simple Micellar because I go camping every summer. Sometimes, I don’t have access to a sink or running water to wash my face. Micellar would be so perfect…and SIMPLE! Great idea! My favorite Clinique makeup remover got discontinued a few years ago, so I’m on the lookout for a replacement. I’m looking for something that is effective for cleansing and feels refreshing and this seems like this might work. No rinse, hydration, and cleansing all sound like good reasons to me. No rinsing!! Plus, I have sensitive skin, so “gentle” is always a plus ! I love the fact that you do NOT have to rinse it off!! I love anything that saves me time in my morning and evening routines! I have allergies, and such a pure product could be a great “safe” way to cleanse. I have sensitive skin and would love to try this – especially since you don’t have to rinse! I like using “towelettes” because you don’t have to rinse so would love to try these! The no rinsing is definitely my reason for wanting to try this. I had a stroke & have trouble with small motor skills & memory (can’t tweeze my eyebrows or put on eye makeup, & & & ) this would be SO EASY for me. I have heard so much about these new products and would love a chance to try one, risk free! Thank you! The fact that you do not have to rinse makes this a great product to use camping. Since I am at that age where by skin is changing, it would be a perfect time to try this product. I like that it’s gentle and thorough cleanse, thank you! Finding this fascinating! Newborn is leaving me less and less “me” time. Sometimes I barely brush my teeth and wash my face. I need beautiful n hydrated skin yes please! I want to try the facial wipes they sound amazing. No rinsing sounds so wonderful!! are you kidding me! no Rinse! I would love to try the new Simple Micellar because a no rinsing cleanser would be perfect for all the traveling we do! Love the Simple product. Can’t wait to try this. NO RINSING! I usually use wipes because I hate rinsing and making a big water mess. Micellar water seems to be the latest rage. I am curious because I have super sensitive skin and most cleansers do not work for me. The no-rinse thing is a bonus! Seems easy – I’d love to try it! I’d like to try this product because I have heard good things about the Simple line of products and want to try them out. Love that it doesn’t leave the skin feeling greasy or oily like other make up removers! love simple products! would love to try! The no rinse factor is amazeballs. I love the fact you do not have to rinse. I love washing my face, but sometimes you are just too tired so I use face wipes. This sounds even better! I have never tried any of the Simple Products from Target, but I have heard really good things about them! I would love to try to find something that is more gentle and natural on my skin!! I would love to try this product! It definitely sounds like something we all need in this drought… Plus for me, I usually “forget” to wash my face before bed because by the time I finally get my kiddos to sleep, I’m either 1. Already asleep or 2. Ready to sleep! This sounds like it would be a quick and easy fix for my “forgetfulness”! I love the pureness of it. I would like to try this product because it provides a gentle but thorough cleanse. I would love to try this. Not having to rinse sounds perfect to this busy mom! I would like to try it because you dont need to rinse and lately I have been having acne problems. I love SImple’s other products; I’d love to try a new one! I have 3 kids so I need something fast AND I am approaching 40 so I need to be better about taking care of my skin. I like the two in one! it cleanses and moisturizes in one step!! Seems simple and I always love trying new things. This Simple Micellar Water sounds wonderful since it does many things at one time, like unclogging pores, as well as hydrate. It also doesn’t contain harsh ingredients, sign me up! agree. no rinsing sounds awesome! I like products without harsh ingredients! My skin has been so dry this winter I need something new to try! No rinse?? Yes please! My boys barely give me time to brush my teeth, much less anything else! Would love to try it out!! Love that you don’t need to rinse!